Who is up for a one off cross over picture? I really like Touhou crossover with other series. A long time ago, I tried doing this one picture. That picture was a far cry from what I was trying to attempt. I always wanted to try and revisit the idea in the future, I originally thought of making a remake so to speak of that picture. Plus I been wanting to do something with Homura and Sakuya. A while ago I though, wouldn't it be interesting if Homura and Sakuya ever fought. Two time manipulating combatants who use their powers and conventional weapons in a similar manner. Thus, this picture was born. After hours trail and tribulations of both me and exilehero this was one of the many pictures I took. 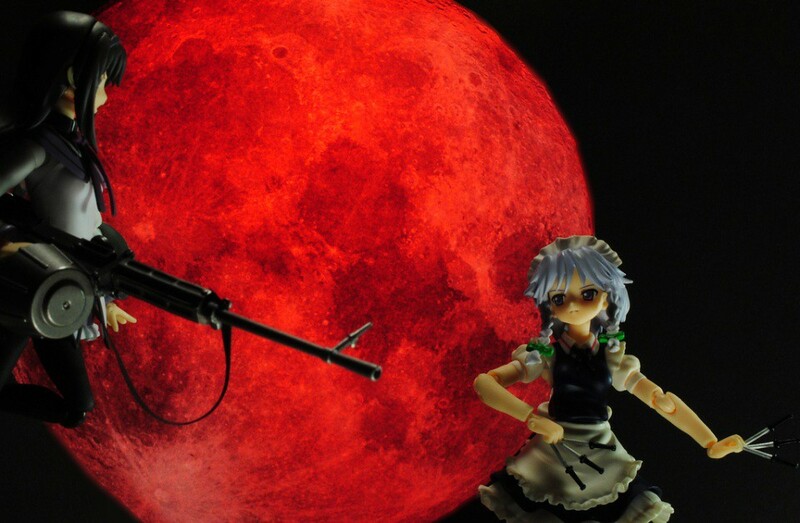 I finally got to do my original idea with a shout out to Embodiment of Scarlet Devil with a red moon as a backdrop.